Pomeroy Apartments Update Reviewed by Edgeville Buzz on September 24, 2010 . 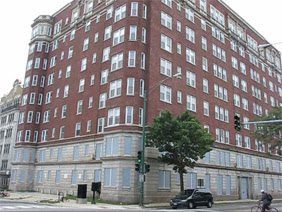 The Pomeroy, an 87-year old, nine-story brick building on the north side of Chicago, was closed in 2006 because the aging mechanical systems were failing and the cost of ongoing repairs had become prohibitive. Recovery Act funding will enable the Chicago Housing Authority to rehabilitate the property and reconfigure the interior floor plans to create 104 one-bedroom apartments for senior citizen public housing. The building will undergo a renovation including new mechanical, electrical and plumbing systems, new elevators, new kitchen and bathroom cabinets, fixtures, and appliances. The Pomeroy Apartments project is part of CHA’s plan to facilitate transformational energy efficiency and “green” retrofits in order to increase building efficiency and environmental performance of public housing properties and thereby reduce energy costs, generate resident and CHA energy savings, and reduce green house gas emissions attributable to energy consumption. The project will have a green (vegetated) roof providing insulation for the building, reducing heat loss in winter and cooling costs in the summer. Seventy-three workers will help with interior demolition, and 32 workers will help with various pre-development activities.